Predaking is just one of six sets of combiners featured in the “Rise of the Combiners” expansion pack, available on March 1. 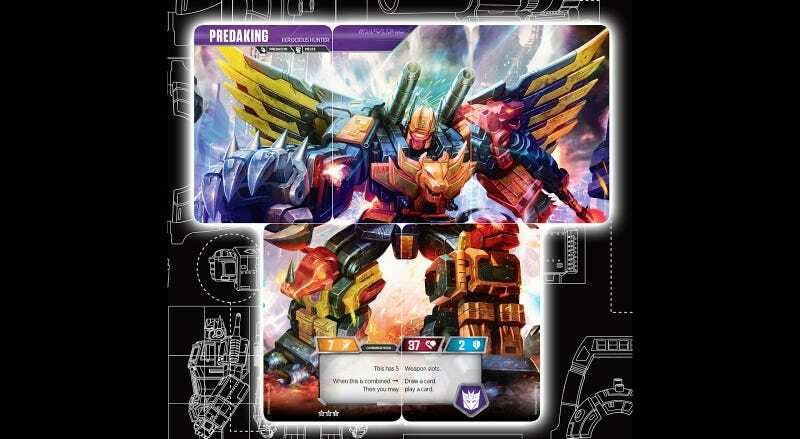 Via a new mechanic introduced in the expansion, players will be able to collect the five characters that make up Predaking’s torso, arms, and legs, and then form them together into one ultra-powerful unit. The combiner mechanic depends on special cards called “Enigmas.” A player must have all five of the combiner robots in bot form in their battlefield or KO area. When the conditions are met, the enigma card can be activated, fusing the five into one. To keep things fair, any damage the individual units incur during the game is carried over into the combined form. For Predaking, that means the player needs to have Torox, Divebomb, Headstrong, Razerclaw and Rampage in play. Predaking is a massive beast of a combiner with tons of health, a nasty attack rating, and room for up to five upgrades. He’s also a big target, meaning his defense isn’t great, leaving him open to attacks from new characters like Windblade, the Autobot combiner hunter. Once again, the Transformers Trading Card Game finds exciting ways to translate the action and adventure of the comics/cartoons/movies/toys into cardboard form. I’m looking forward to seeing who else I can put together when the 46 new character cards and 81 battle cards of the Rise of the Combiners set arrive.